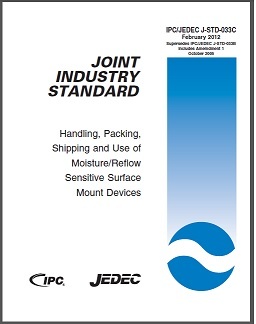 In 2013, the JEDEC Solid State Technology Association announced the newest standard of Handling, Packing, Shipping, and Use of Moisture/Reflow and/or Process Sensitive Components. This document provides SMD manufacturers and users with standardized methods for handling, packing, shipping and use of moisture/reflow sensitive SMDs. Now updated to support components that may need to be processed at higher temperatures, such as lead-free processes, these methods help avoid damage from moisture absorption and exposure to solder reflow temperatures that can result in yield and reliability degradation. IPC/JEDEC J-STD-033C helps achieve safe and damage-free reflow with the dry packing process and provides a minimum shelf life . The advent of surface mount devices (SMDs) introduced a new class of quality and reliability concerns regarding damage from the solder reflow process, such as cracks and delamination. 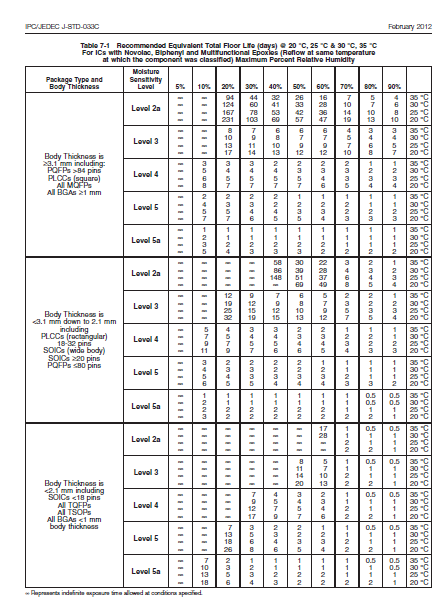 This document describes the standardized levels of floor life exposure for moisture/reflow sensitive SMDs along with the handling, packing, and shipping requirements necessary to avoid moisture/reflow related failures. Companion documents J-STD-020 and J-STD-075 define the classification procedure and JEP113 defines the labeling requirements. For moisture sensitivity, moisture from atmospheric humidity enters permeable packaging materials by diffusion. Assembly processes used to solder SMDs to printed circuit boards (PCBs) expose the entire package body to temperatures higher than 200 °C. During solder reflow, the combination of rapid moisture expansion, materials mismatch, and material interface degradation can result in cracking and/or delamination of critical interfaces within the device. Typical solder reflow processes of concern for all devices are infrared (IR), convection/IR, convection, vapor phase reflow (VPR), hot air rework tools, and wave solder, including full immersion. Non-semiconductor devices may exhibit additional process sensitivities beyond moisture sensitivity such as thermal sensitivity, flux sensitivity, or cleaning process sensitivity. The purpose of this document is to provide manufacturers and users with standardized methods for handling, packing, shipping, and use of moisture/reflow and process sensitive devices that have been classified to the levels defined in J-STD-020 or J-STD-075. These methods are provided to avoid damage from moisture absorption and exposure to solder reflow temperatures that can result in yield and reliability degradation. By using these procedures, safe and damage-free reflow can be achieved. The dry-packing process defined herein provides a minimum shelf life of 12 months from the seal date. This standard applies to all devices subjected to bulk solder reflow processes during PCB assembly, including plastic encapsulated packages, process sensitive devices, and other moisture sensitive devices made with moisture-permeable materials (epoxies, silicones, etc.) that are exposed to the ambient air. The popcorn effect is when the IC “pops” because the moisture inside the package expands in the reflow process. As a result of this expansion the substrate, the die, or the wire bonds could be damaged. The damage is often invisible and requires X-ray equipment to conduct a proper analysis. When the anti-static bag is opened and the ICs are exposed to ambient conditions, the moisture in the air is trapped inside the device. This means that during the PCB assembly process (e.g. reflow) this moisture expands and can damage the device. Moisture Barrier Bag (MBB) The moisture barrier bag shall meet MIL-PRF-81705, Type I requirements for flexibility, ESD protection, mechanical strength, and puncture resistance. The bags shall be heat sealable. The Water Vapor Transmission Rate (WVTR) shall be ≤0.0310 g/m2 (0.002 g/100 in2) in 24 hrs at 40 °C after flex testing per condition ‘‘E’’ASTM F 392. The WVTR is measured using ASTM F 1249. Desiccant The desiccant material shall meet MILD-3464, Type II. Desiccant shall be dustless, non-corrosive, and absorbent to amounts specified in the standard. 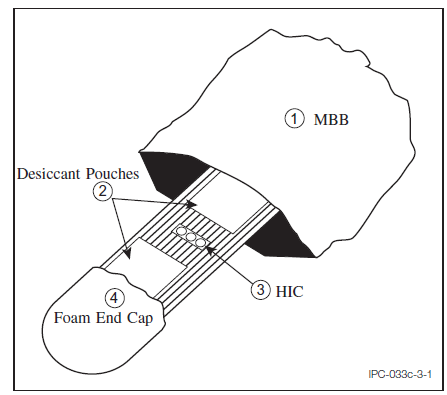 Desiccant has a very limited floor life and should be stored and handled per the manufacturer’s recommendation prior to insertion in the MBB. The desiccant material shall be packaged in moisture permeable bags or pouches. The amount of desiccant used, per moisture barrier bag, shall be based on the bag surface area and WVTR in order to limit the interior relative humidity in the MBB, at the end of the calculated shelf life, to less than 10% at 25 °C. For comparison between various desiccant types, military specifications adopted the UNIT as the basic unit of measure of quantity for desiccant material. A UNIT of desiccant is defined as the amount that will absorb a minimum of 2.85 g of water vapor at 20% RH and 25 °C. Desiccant Handling and Storage Desiccant capacity decreases rapidly when exposed to 30 °C/60% RH. Therefore the desiccant should remain in the manufacturer’s container or stored in a drycabinet at <5% RH until use. When dry packing, the desiccant shall be removed from the storage container just prior to placing it into the MBB and sealing the MBB. Humidity Indicator Card (HIC) At minimum, the HIC shall have three (3) color spots with sensitivity values of 5%, 10%, and 60% RH. An example HIC is shown in Figure 3-2. The spots shall indicate the humidity with a significant, perceptible change in color (hue) as indicated in Table 3-2. Hue shall be tested using the test method in Appendix A. The colors shall be described in writing on the card. The 5% and 10% HIC spots shall be reversible to allow reuse. HIC reuse is not allowed if the 60% spot has changed color. Reuse is not allowed, due to loss of accuracy of the 5% and 10% spot chemistry, if the 60% spot has changed color. It is not required to reuse the same HIC from the MBB if the MBB is to be resealed; a fresh HIC may be used. At a 30 °C/60% RH environment the 5% spot shall begin to change from dry indication in a maximum of 4 minutes and complete change (to wet indication) in 7 minutes and the 10% spot shall begin to change from dry indication in a maximum of 6 minutes and complete change (to wet indication) within 10 minutes when removed from manufacturer’s original container. HIC Paper White blotting paper made from fibrous, cellulosic material, with a minimum basis weight of, 255 g/m2 (equivalent to a nominal 170 pounds basis weight) shall be used for HICs. 4.1.2 Short Duration Exposure Previously dry SMD packages, which have been exposed only to ambient conditions not exceeding 30 °C/60% RH may be adequately dried by room temperature desiccation using dry pack or a dry cabinet. 4.1.2.1 Moisture Sensitivity Levels 2-3 For moisture sensitivity Levels 2, 2a, 3 with floor-life exposure not greater than 12 hours, a minimum desiccating period of 5X the exposure time is required to dry the SMD packages enough to reset the floor-life clock (see Table 4-3). This can be accomplished by dry pack according to Clause 3.3 or a dry cabinet that is capable of maintaining not greater than 10% RH. For components exposed anytime less than their stated floor life, dry packing or placing the components in a dry cabinet maintaining not greater than 10% RH, will stop/pause the floor-life clock as long as the cumulative floor life meets the conditions in Table 5-1 and/or Table 7-1. 4.1.2.2 Moisture Sensitivity Levels 4, 5, 5a For moisture sensitivity Levels 4, 5, 5a with floor-life exposure not greater than 8 hours, a minimum desiccating period of 10X the exposure time is required to dry the SMD packages enough to reset the floor-life clock (see Table 4-3). This can be accomplished by a dry cabinet that is capable of maintaining not greater than 5% RH. Once the floor-life clock has been reset, refer to Clause 5.3 for safe storage conditions. 4.2 General Considerations for Baking The oven used for baking shall be vented and capable of maintaining the required temperatures at less than 5% RH.